From April 1, to September 27, 2017, 1,212,351 hectares (2,995,784. acres) of forest in the province of British Columbia was in flames. Clear cut forestry and mono culture has enabled wildfires to spread that would normally have been relatively contained in a sustainably managed forest with robust, mixed vegetation resistant to pests and disease, and rich aerated humus helping to retain moisture on the forest floor. While the forests burned and the air throughout the province was thick with smoke, I spent three weeks camping in a small tent on Vancouver Island at Wildwood, an eco-forest that has been sustainably harvested since the 1930's by the legendary Merv Wilkinson - now deceased - who received the Order of Canada for his pioneering work in forestry. Most of us have never experienced the wonders of the primal old growth forest; to stand amongst giant Douglas Fir, Cedar and Spruce that have lived not just decades but many centuries - some more than a thousand years of age - to contemplate the countless creatures that thrive within a grandparent tree's roots, trunk, and leaves - all an integral and vital part of a healthy ecosystem. 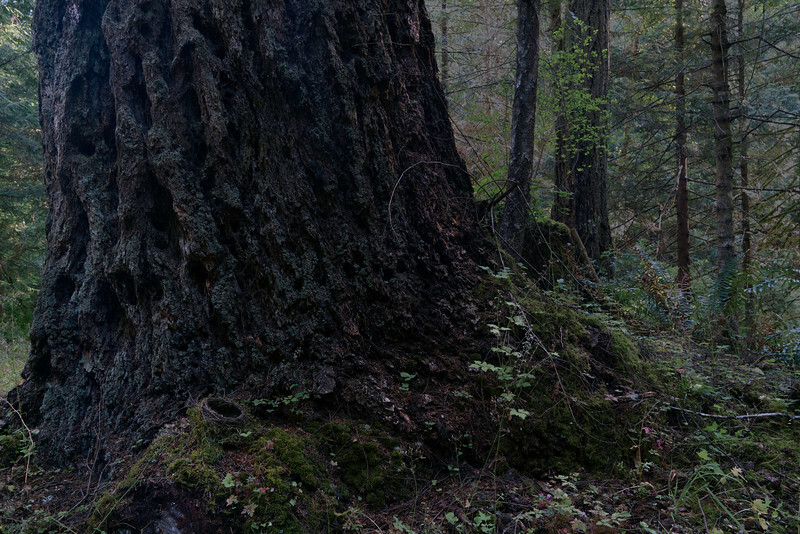 This series explores first growth forest families and second growth forest left to regenerate on Vancouver, and Malcolm Islands and an island in Clayoquot Sound off of Canada's West Coast in the province of British Columbia. Sadly, there is just .03% of primal forest remaining on Vancouver Island. Malcolm Island was completely logged, and the island in Clayoquot Sound remains a primal forest in private hands. That there is any first growth at all is due to the environmental activism, and vigilance of ordinary citizens, environmentalists and First Nations on the West Coast and beyond. An elder tree is a host to a myriad of life forms. A bird's nest is visible at the base of the tree. Douglas Fir has an incredibly thick bark that is resistant to the fire required for it to reproduce. This grandparent displays First Nation burn marks.